During a stressful day the urge for cake, chocolate and sweets emerges. What to do? Chocolate may increase productivity but you want to eat fruit as snack. How To Prompt Fruit Consumption? In our daily collaboration with organizations, businesses and public institutions we are often asked about examples of health nudges. There is a a long list of well documented studies that can be referenced and used as examples. Sometimes, however, we come across a nudge that has been implemented on completely intuitive ground by hands-on individuals. At Hotel Svendborg – a conference center in Denmark – a clever solution was presented in order to nudge people towards the healthier choice. Often we have a hard time living up to our own ideals about eating healthy – especially when we are in settings that demand much of our cognitive resources. Most of us are familiar with the urge for quick sugar rushes when we participate in meetings. Our hands, if not our minds tend to wander to the sweet taste of chocolate, cake or candy. Experimental evidence suggest that not only is this tendency common among a lot of people, but also that there is a set of mechanisms that accounts for this tendency. For instance, in one experiment researchers gave participants a simple task. The participants were asked to remember either a two-digit number or a seven-digit number. Before asking the participants to recall their numbers, the participants were offered a choice of either fruit salad or cake. 63% of those asked to memorize the seven-digit number chose cake, whereas only 41% of those given the two-digit number chose cake. The theory behind this result is that when people are performing tasks that require a higher degree of cognitive processing resources, they tend to make choices that are based on affection rather than on higher order preferences – e.g. a healthy lifestyle. This result suggests that if a busy or stressed person aims at eating healthy, then special attention might be needed to help attaining that goal. In other words, health nudges might be more effective and helpful for people in stressful situations where demand on cognitive processing resources are high – which the case (all else being equal) for guests at conference centers. During our workshop at Kolding School of Design as part of the Nudge Design Camp 2012 we met interior designer, Susanne Magelund. At an earlier stage, she was given the task to re-decorate parts of the conference facilities at Hotel Svendborg – a hotel and large conference center in Denmark. Her objective was primarily to create aesthetically pleasing solutions to the interior design challenges at hand. But more interestingly from our perspective, she was also asked to create solutions that were in par with the hotel’s goal of being a facility promoting a healthy lifestyle. Figure 1. 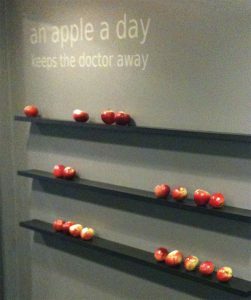 Shelves with apples at Hotel Svendborg. Hotel Svendborg observed an immediate effect of this nudge. After installing the shelves, the restaurant manager had to order two more crates of apples pr week. 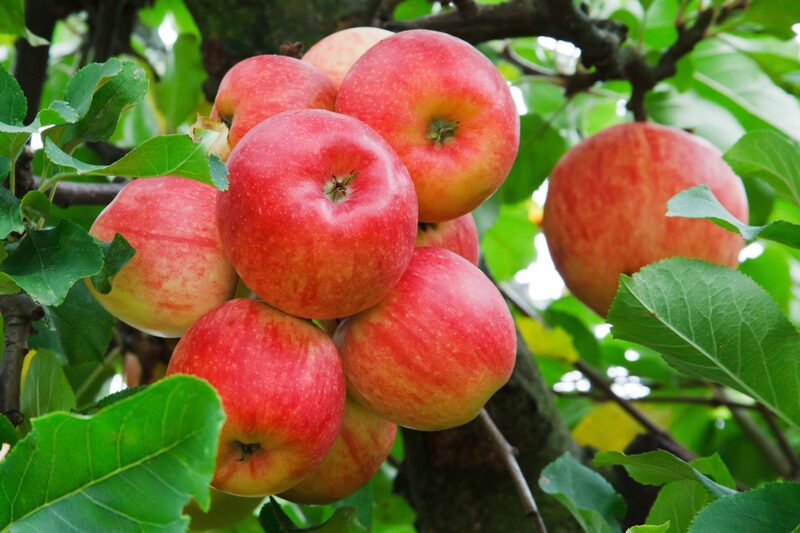 When we inquired into relative increase in the demand for apples, we were given a rough estimate of 5-10%. Not bad for a few shelves, a little paint and an old saying. It should be noted, however, that these measures by no means are comparable to scientific standards. Interestingly, the staff at Hotel Svendborg noticed a demographic difference in the action that the apple shelves prompt. The younger conference guests tend to pick apple straight off the shelves, whereas older guests grab fruit from a basket placed next to the shelves. It seems that the apple shelves have an effect on both of these demographic groups, but where the younger guests are more willing to “interact” with the design, older guests considers it merely as a display. But how and why does it work? There are several great things to notice about this solution. Third, the well-placed shelves with salient apples are presented with situated information. The saying “an apple a day keeps the doctor away” prompts a preference held by many people to eat healthy. The saying is well known, easily interpretable and is a piece of information offered at the crucial point of decision making to remind the willing to eat healthy. (1) The designer’s solution needs to rely on behavioral insights – either explicitly, or as in this case, intuitively. (2) For the design to work in the long run, the designer’s ability to structure and shape her solutions in the specific context of her objective is crucial. In the above explicated case, the designer needed to create an aesthetically pleasing solution – otherwise she would have failed to do her job. That the solution also managed to increase consumption of apples, and thus satisfy the objective of presenting the conference center as a health promoting place, is due to behavioral aspects of the specific design shaping the build environment.